"Yes, art is placemaking. But art is also future making. Art rejects the limitations of what we are and what we have been. It inspires us to imagine what we will be." Editor's Note: Since 2011, the Santa Cruz Museum of Art & History (MAH) has been developing a plan to transform neighboring Abbott Square into an exciting cultural hub for the city's downtown. 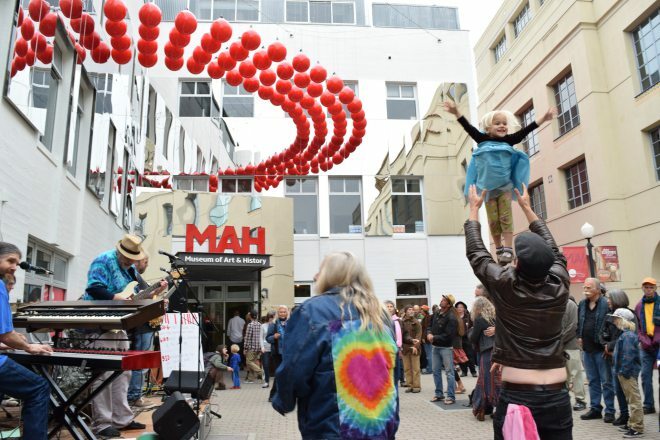 In 2013, PPS joined MAH in Santa Cruz to kick off a series of Placemaking workshops to help further this community vision, which was part of a larger effort to establish downtown Santa Cruz as a major destination that could spawn additional art and cultural activities around the city. The following article by MAH Executive Director, Nina Simon, is part of an ongoing series for her blog Museum 2.0. As the countdown has begun for the completion of this major expansion project, the series highlights some of the stories behind this multi-year effort to transform Abbott Square. "This is not your typical museum expansion," Simon explains. "When the construction is complete, we will have added zero square feet of gallery space. No new classrooms. Not an ounce of storage space, office space, nor exhibit prep space. Instead, we’re spending five million dollars to take our museum outside." At PPS, we can't wait to visit the new plaza when it officially opens in June 2017, and we couldn't have imagined a better future for the space and its surrounding community! The MAH fundamentally has two jobs: we bring art and history out into our community, and we invite our community in. Over the past six years, we’ve done a great job bringing the community into the MAH. Our audience has quadrupled in size, and the people walking through our doors increasingly reflect the age, income, and ethnic diversity of our County. We’re proud that the MAH is a thriving museum AND community center for Santa Cruz County, a place for people of all walks of life to connect around our shared creativity and culture. There’s a lot of love inside the MAH these days. But in the spirit of that last visitor comment, we feel it is our responsibility and our glorious opportunity to spread that love beyond our walls. If we only build community inside the building, we’re trapping ourselves and our visitors in a bubble. We want to break out. We want the MAH’s inclusive creative energy to ripple across our county. Our vision is to build a stronger, more connected community through art and history. If we really want to achieve that vision, we’ve got to get to work in all the places where people live, work, and play. We’ve experimented with beyond-the-building engagement through projects like the Pop Up Museum, Evergreen Cemetery restoration work, and partner-led festivals. I’ve seen again and again how outdoor programming has impact beyond what can happen inside the museum. Some casual passers-by jump in to participate, and even when they don’t, they get a bit of a contact high from the fact that art is happening as part of their urban experience. The engagement may be less intimate and focused, but the opportunity for ripple effects is greatly increased. The impact outdoors is wider and wilder than anything that happens inside the walls of an institution. When we started the project four years ago, the primary reason to expand into the plaza was about marketing and audience development. Abbott Square physically connects the MAH to the main drag of downtown Santa Cruz. Four years ago, we were in the early stages of expanding and diversifying MAH programming, and we saw Abbott Square as a key physical connection between the growing museum and the vibrant creative life of downtown. Furthermore, we learned from a Latinx-focused ethnographic study that outdoor programming was particularly appealing to local Latinx families. We wanted to reach more people, and more diverse people, and we saw Abbott Square as a great place to do it. Once we started community conversations about the potential for Abbott Square, the “why” shifted to community desire for a town square. While locals were interested in the MAH, they were MUCH more interested in having a downtown gathering place. We don’t have a town square in Santa Cruz, and people feel the acute lack of creative public space. What started as being about the MAH became more about the community. Community members’ expressed needs and desires drove the planning of Abbott Square and led to major decisions we would not have made if this project was “just” a MAH extension (more on community involvement in next week’s post). While this was exciting, it was also a bit disconcerting. At times, it felt like we were taking on a new sister project to the MAH in Abbott Square, as opposed to an expansion of our existing work. To my grateful surprise, that sense of separation resolved itself as the MAH's strategy evolved in alignment with the project. While we were designing Abbott Square with community members, we were also strengthening the MAH’s overall commitment to community-driven programs. Three years ago, we wrote a new MAH theory of change with an impact statement to build a stronger, more connected community. We knew this impact could only happen if we expanded our work further beyond our walls. Through the lens of our new theory of change, suddenly Abbott Square was core to our overall institutional strategy. Just as we have opened the MAH up to more diverse people, perspectives, art forms, and historical narratives over the past few years, now we are physically opening our facility with new offerings that are accessible and appealing to a much wider audience—including thousands of people who might not ever set foot in a museum. The people who enjoy Abbott Square’s whimsical Secret Garden, locally-rooted public market, and free outdoor performances will all experience the MAH—whether they also visit exhibition galleries or not. This intersection is not entirely a coincidence—the MAH and the Abbott Square project grew up together—but it was reassuring to realize that the community’s interest in Abbott Square was in our strategic best interest, too. And finally, a fourth “why” was key throughout planning: Abbott Square was designed to generate revenue and maximize use of our real estate assets. The MAH has an unusual business model in that part of our revenue comes from managing Abbott Square plaza and an adjacent commercial office building. By incorporating a food market in the ground floor of that building (something community members urged us to do as part of the project), we are hopefully building a sustainable revenue source into Abbott Square. At the same time, we’re transforming a “high income, low mission impact” asset into a “higher income, high mission impact” asset. Hopefully. I firmly believe that more creative institutions should be in the public space business. If we care about building community, we can’t just do it within our walls. We live in a time—especially in the United States—when people are more divided than ever. Space is contested, privatized, and segregated. Working on this project has opened me up to the incredible opportunities we have to claim public space for our communities and for the values that underlie our work. Many people call this work “creative placemaking.” The idea is that creativity—not just sculptures or murals but events, art-making, art-sharing, commerce—can help turn an intersection or a riverfront or a concrete wedge into a place with a story and an identity. Creativity and culture connect us to place and to each other. Yes, art is placemaking. But art is also future making. Art rejects the limitations of what we are and what we have been. It inspires us to imagine what we will be. 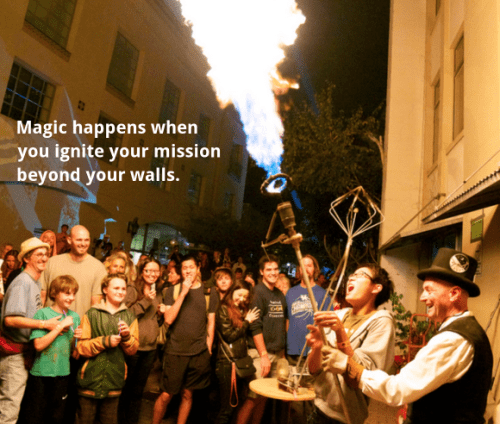 I want to imagine a future of downtown Santa Cruz in which creativity, commerce, and community are all welcome. I want to imagine a future in which the spirit of welcome and inclusivity that permeates the MAH spreads throughout our whole town. We’re trying to build a slice of that future in Abbott Square. What future do you want to build in your community? ** Explore each part in Nina Simon's series on the MAH's expansion into creative public space, and be sure to check back for updates!